Reading God's word over and over, coming into his presence can seem time consuming and maybe a waste of time. You know the gospels you've read them lots, what more can they say. Anyway, you go to church every week, you hear the preacher and learn through him what God has to say. Now I'm not saying that your preacher is not preaching the truth, but how would you know? If someone tells you all about a film, do you feel you don't need to watch it, you already know it? Or if you read the synopsis or a review of a book, do you think there's no point in reading it? In the same way the preacher gives a glimpse, a small revelation of a tiny part of God's word, that doesn't mean you don't need to look any further. The reason I give you links to the passages in each days study is so that you can read the chapters for yourself, don't just take my word that this is what it says. The Pharisees taught the law and Jesus tells the people that they must be obeyed, you must do what they tell you (23:3). However the Pharisees did not only teach the Old Testament law, they taught a lot of rules and practised traditions that were of their own making. Jesus warns, do as they teach but don't live as they do. They knew the law and they stuck to it, religiously! But, they were not in a relationship with God. In Chapter 23 we get a real look into the difference between a religion and a relationship. The trappings and external displays of religion are described here as seven woes. Read them, recognise them and be wary of them. Do not rely on your preacher, your daily reading or your favourite Christian speaker - look only to God. In these verses you can see what you need to be careful of, it is very tempting to get pulled into the hype and excitement of an enthusiastic teacher, and what they are saying can sound good and the way they are can seem very godly, but beware of following someone preaching God, rather than God himself. It can be difficult to commit to a study every day, but don't give up. If you've missed a few days, it doesn't matter - if you missed the first week, it makes no difference, just don't give up. Jesus does not give up on you, his heart still reaches out. Look at how he responds at the end of Chapter 23. Jesus spends the whole of this chapter rebuking the Jewish leaders, calling them blind fools and hypocrites and yet as he ends in verse 37 you can almost hear his exhaustion and heartbreak as he speaks of how he has longed to gather them in, but they were not willing. No matter how often they missed the point, no matter how wrong they kept getting it, no matter how often they went their own way Jesus still wanted them, his heart ached, he wanted to gather them to him. Many have heard the news and have been offered the gift of Jesus, but they turn away, they are not willing. Still Jesus reaches out to them. No matter what your past or where you are in life, Jesus' heart still reaches out to you, he wants to gather you to him. Have you moved away from God's embrace and wonder if there is a way back? Do you want this relationship but think Jesus doesn't want you? Do you think you've being living wrong for too long? Lord, I know that I have been blind and followed my own ways but I am willing to hear you. 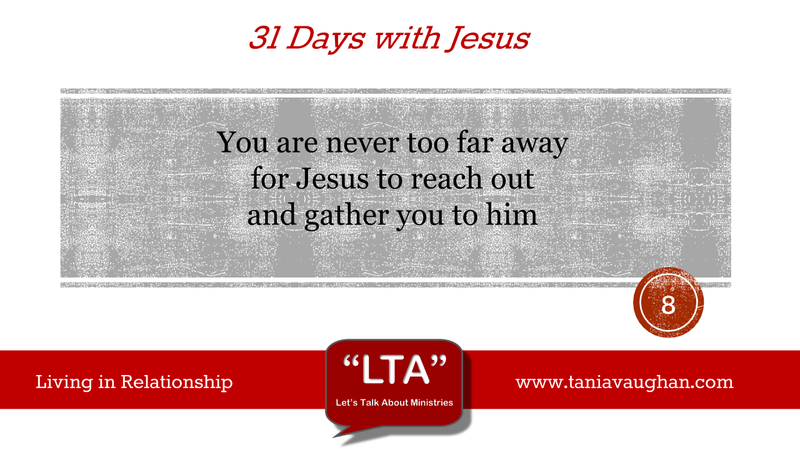 I thank you that no matter how far away I have been you want to gather me to you. I want to seek what you have to say, not what others say to me about you. I want to know you for myself and seek a deeper relationship in your word, make it alive for me as I read.